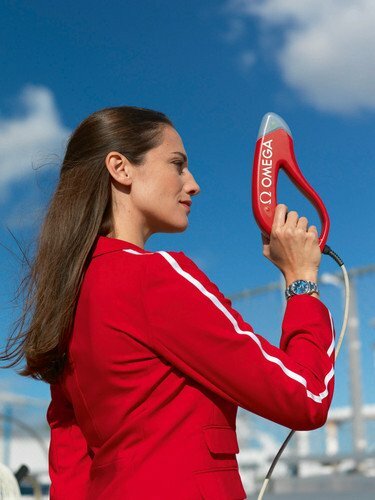 So you want to buy the newest Omega starting blocks that will be used in the London Olympics? Sure, anyone can buy them. It will cost you 4,800 CHF (Swiss Franc) or about $4,910 US dollars. Chump change for Usain Bolt, so he bought one. After his false start last year, everything has to be perfect and comfortable in London. Not everyone has the luxury of owning a pair. Most athletes show up a few days prior to the big meets and get used to them on the warm up track. The Jamaican trials does not have the luxury of using these blocks, and the USA uses the Gill Fusion 1 Starting Blocks for all their Championship meets. For more information on how to use starting Blocks, see the updated Rocket Sprint Start by Bud Winter and myself. 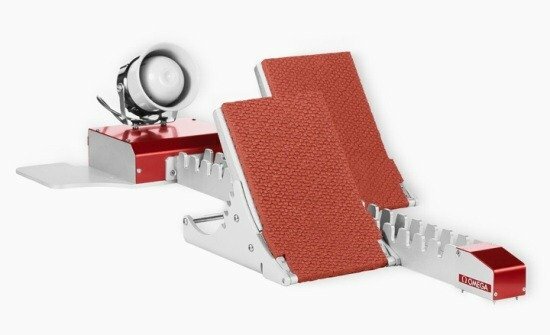 The new Omega starting blocks were introduced this season and are used in all Diamond League Meets, for which Omega is also the official timekeeper. They will be used for the 2012 London Olympic Games. The new Omega Olympic starting block design has a few minor changes. 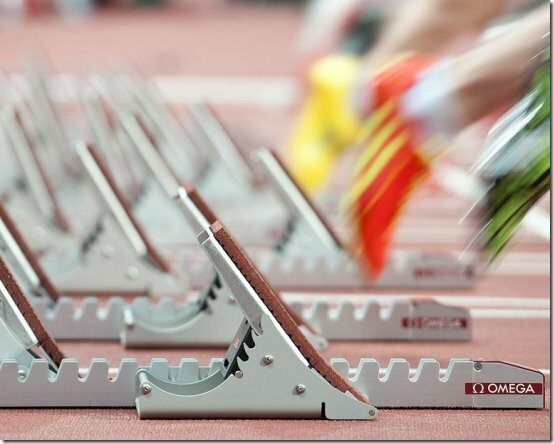 First, the biggest complaint from sprinters about the starting blocks was the slight movement, up to 5mm. The new starting blocks are presumably “rock solid” and does not move. The central bar has been reduced from 80 to 50 mm allowing better starting positions for women. The foot rests are now wider, having been expanded from 120 to 160 mm, allowing for different starting positions. So how much force can be produced at the start? I’ve heard numbers like twice your body weight but in a recent test with Asafa Powell, he was pushing 240Kg or three times his body weight (assuming 176lb = 80kg). Hence another good reason to do squats of all angles, half squats and quarter squats, well past your own body weight to match those angles in the starting blocks, but also to work the full range of motion of your muscles. That being said, I guess Usain Bolt isn’t taking any chances for his preparation for London, so he wants the exact same look and feel before settling into the blocks for the greatest show on earth! The new starting “gun”, which made its debut in Vancouver 2010, does 3 things when the starter pulls the trigger: (1) flashes a light (2) sends the sound to the speakers (3) starts the timer. I don’t like it, but at least they won’t ask questions at the airport! Sprinters 2012 London .. Old School tactic if you false start quickly point to crowd “crowd noice” or camera click….this may give officials cause to debate in your favor ..Tech detection can’t be fooled ..hope for the human element . Usain simply bought the Starting Blocks because they come with the Starting Gun and the Starter Lady holding the gun in the picture. It’s a Kit. As simple as that. I rest my case. Where can I purchase 6 set of OMEGA starting blocks ? I tried contacting Swisstiming but I haven´t received any response yet. Any help would be appreciated.